Both are originally from St. Louis, Missouri, and are now residing in the beautiful state of Florida. Tim has been flying for over 30 years. He started flying the Stearman and J3 Cub with Cochran Aviation at Washington Airport in Washington, Missouri. Tim is a CFI, CFII, Commercial, Multi-Engine and Sea Plane rated pilot/instructor. He has over 15,955+ TT, 14,630 TW time, 7000+ Stearman time and 11,250 Tailwheel Instruction. He is a licensed Airframe and Power Plant Mechanic (A&P) with Inspection Authorization (IA). 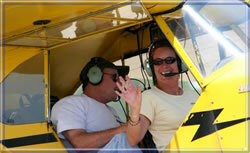 In addition to instruction and rides, Tim has extensive experience in Stearman maintenance. He is available for pre-purchase consultations.